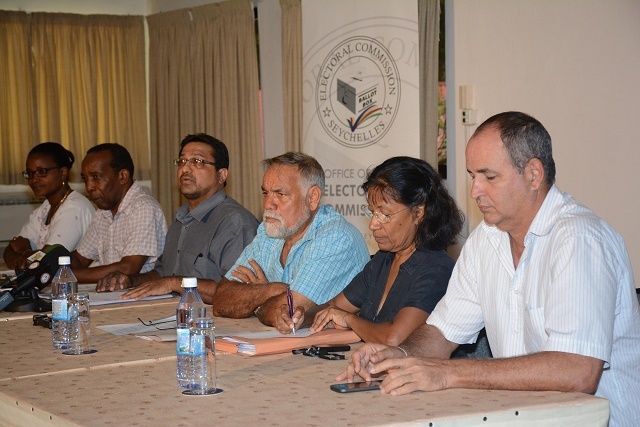 (Seychelles News Agency) - Only a day after announcing that presidential elections in the Seychelles islands will be held from November 19 to 21, 2015, the island nation’s Electoral Commission has gone back on its decision. In a press statement issued this afternoon, the Office of the Commission said that it will be announcing new dates for the polls to allow more time for the political parties to prepare themselves. This follows a meeting held today with representatives of all registered political parties in preparation for the upcoming polls. “…There was concern expressed by the majority of the representatives of the Political Parties that the dates of the Presidential Elections which were announced for the 19th, 20th and 21st November 2015 would place them at a disadvantage,” reads the statement. There are presently eight officially registered political parties the Indian Ocean archipelago of 115 islands with a population of around 93,000 people. The Electoral Commission has said that it “recognizes its role to impartially facilitate free and fair elections within the limits of the Laws of Seychelles” hence the decision to reconsider the dates. Contacted by SNA, the Chairman of the Electoral Commission Hendrick Gappy said that the new dates for the presidential elections will be published in the official gazette early next week. The Electoral Commission has 90 days counting, since last Friday to organize the election process, after the incumbent President James Michel called the presidential elections on Thursday October 1, highlighting that he will be seeking a third and final five year term at the helm of the Seychelles government. The last presidential election in archipelago of 115 islands was held in May 2011. According to the country’s constitutional requirements, the next presidential election should be organised within 90 days after January 2016, although the Head of State can call early presidential elections, according to the 5th amendment of the Seychelles constitution.